Varius is an easy to install and adjust walk-in closet. Its shelves lighten the structure by a twisting movement. You can compose it in a multitude of horizontal or vertical solutions according to your needs and habits. Precious accessories for the interior such as glass dressers with wooden base, and extensible elements for trousers and shoes. Barefoot and wearing just a bath towel after a reinvigorating shower and ready to choose our evening dress for our night out. So we approach our walk-in closet. Furnishing cannot be ignored in this room. Everything must be pleasant and well organised. 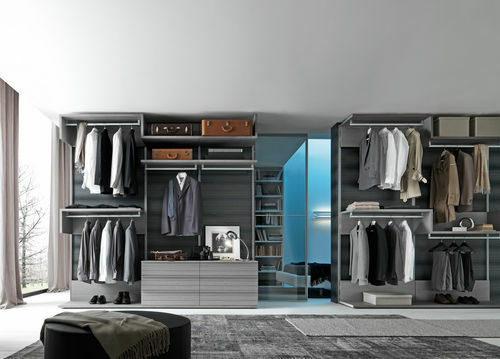 Presotto offers to his customers a multitude of solutions such as walk-in closets planned for all the spaces. As an instance we install these furniture in the attics too. Each one is different from the other because it can be customized with shelves, rails, drawers, tie racks and every size of sliding doors. Or if you prefer we can fit the wall with open units. In this case your clothes decor the room.